PixelJunk Monsters Ultimate has worked its way from PS Vita / PS3 to Steam, bringing with it all the rock monsters, annoying bumblebees, Tesla towers and upgrade dances. It stands out as a solid co-op experience with a few drawbacks, but it's still the best version of PixelJunk Monsters Ultimate we've seen. 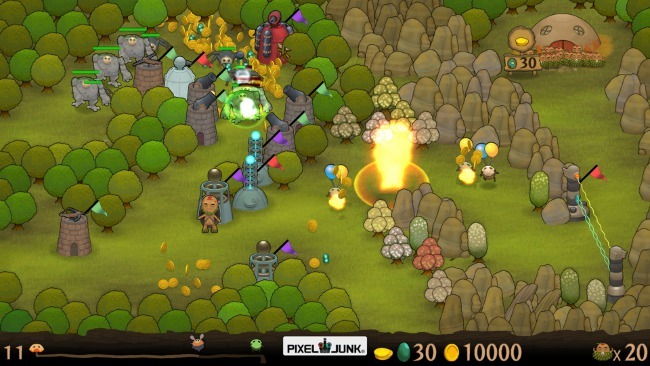 PixelJunk Monsters Ultimate for PC is the same PixelJunk Monsters you know and love. It has all of the DLC, unlockable content and extras from previous releases of the game, along with 20 new achievements, Steam trading cards and badges exclusive to PC, and a handful of miscellaneous tweaks. 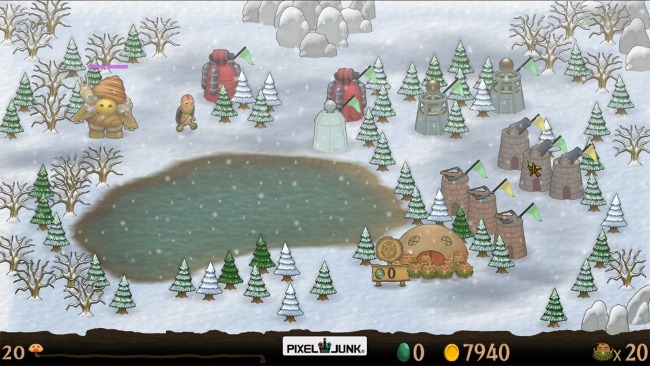 If you want PixelJunk Monsters, this is the PixelJunk Monsters you should get. The basics of the game haven't changed. You play as Tikiman, a lovable little character who's trying to protect his hut from the evil denizens of the forest. Tikiman can stave off the onslaught of foes by replacing trees with buildings, tossing up things like a cannon tower, anti-air guns or a flamethrower. 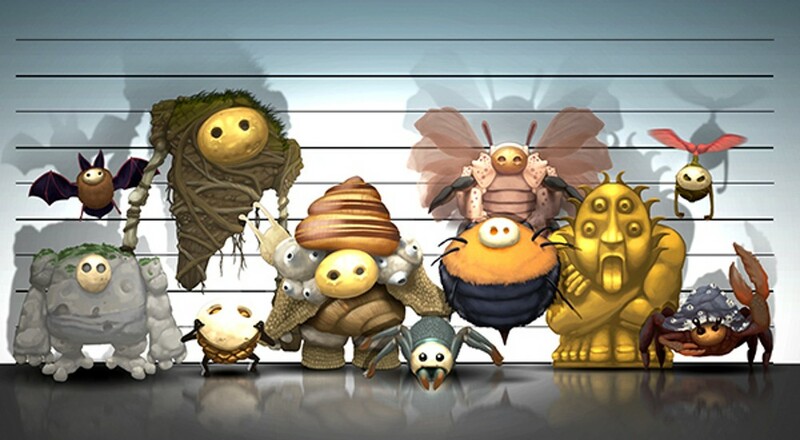 Enemies walk along paths in the forest and come in all variety of sizes and types, each one weak to different towers and strong against others. Only by effectively managing building types, building placements and building upgrades can you survive the game's surprisingly difficult levels. Co-op comes in two main flavors: two player local and two player online. Online seems to be geared towards quick rounds and random match-ups instead of marathon stretches. It doesn't preclude the latter, but the experience feels choppy when you sit down to charge through stage after stage. Join/start a room and find your co-op pal. Set the game options and connect with your friend. Walk through the map and pick a level, then start playing. Complete the level, see your score, exchange virtual high fives. Get kicked out of the game back into the lobby. Return to step one and repeat. This process repeats over and over again, constantly forcing you to re-enter the game. It's little more than a minor nuisance when you're making progress and can stay in a level for half an hour or so, but as soon as you start dying and restarting levels, you'll feel like you spend more time entering the game than actually playing it. On the bright side, PixelJunk Monsters Ultimate features a fix that addresses one of our biggest concerns in the PS Vita version. Previously, progress made in co-op mode was confined to co-op mode. No matter how many levels you completed, once you jumped into single player you had to start all over again. Now, progress transfers back to single player, but with one fairly big drawback: it's only true for the host. If you're serious about seeing everything PixelJunk Monsters Ultimate has to offer, it's best to find a dedicated co-op buddy and trick him/her into letting you be the host. We suggest a rock paper scissors match to determine who hosts. Always pick rock. Rock wins every time. Apart from the issues with constantly starting/restarting co-op sessions, PixelJunk Monsters Ultimate for PC is a fantastic experience. It supports mouse and gamepad controls out of the box, both of which work great with the game (though we recommend the latter if you have a controller handy). If you don't mind dealing with menus on a frequent basis, you'll have a great time gathering gems and dancing to upgrade towers. Page created in 0.9054 seconds.